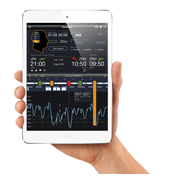 Jeppesen, a part of Boeing Digital Aviation, today introduces CrewAlert Pro, a new iPad app designed to assist airline crew with preventing and mitigating fatigue. Now available for both iPad and iPhone, CrewAlert Pro helps airline crew and safety professionals comply with International Civil Aviation Organization (ICAO) fatigue risk management guidelines. · Predictive capabilities for fatigue avoidance and awareness. · Proactive fatigue data collection. · Provision of operational fatigue mitigation strategies tailored to crew roster context and individual crew settings. · Reactive fatigue reporting to provide a streamlined process for both crew and safety departments. · Analysis of scheduling patterns and fatigue and incident reports. The new CrewAlert Pro iOS app is available for purchase through the Apple App Store in most major global markets for $29.99. CrewAlert Lite, a version of the app solution with limited features, is also available at no charge. To support airlines in fatigue risk management system implementation, Jeppesen offers a comprehensive portfolio of products and services. The web-based Jeppesen Crew Fatigue Assessment Service provides automated crew fatigue metrics for submitted crew rosters. Jeppesen also offers fatigue risk control capabilities during roster optimization processes as well as business consultancy, training courses and fatigue data collection and analysis. For more information on Jeppesen fatigue risk management offerings, please visit www.jeppesen.com/frm. In addition to its fatigue risk management tools, Jeppesen also offers a complete suite of airline-based crew and fleet management services, including Jeppesen Crew Rostering, Crew Pairing, Crew Tracking, Manpower Planning and Tail Assignment.